Joey and I in Bacolod, Oct '13. I remember the first time Joey brought me to Bacolod with him as his girlfriend. Our relationship was about a month old, and it was a joy seeing and being with his warm and jovial family. He took me on a quick “life tour”, showed me where he went to school, where he and his friends used to hang out at, and the church he grew up in, Ikthus. While we were in Ikthus, he decided to go in and check if Manong (Kuya) Gary, their youth leader back in day, was there. Turns out he is, and Joey proceeded to introduce me as his girlfriend. The encounter makes me smile up to this day. Joey and I both offered profuse “opo’s”. It’s a funny story to look back on now, but I also realise the good reasons for Manong Gary’s concern. Both Joey and I have had our hearts trampled on, I broke one, we both expended our time and effort into relationships that didn’t turn out well, blindly fought for who we thought were Mr. and Ms. Right when everyone around who loved us clearly thought they weren’t. Such are the folly and obstinacy of youth, the broken roads we walked on before we found the path to each other. This was what Manong Gary wanted to save us from. He wanted both of us to be sure that if it wasn’t marriage we saw in each other’s future, then we might as well pack up and leave before more hearts get broken. Hoping I would find true love along the broken road"
If only we were mature enough then not to insist on our ways and to heed our elders. You know, it really is true that your parents know best simply because they know YOU best. They have witnessed your character development from the very beginning, from when you were a wheezing toddler to a toga-wearing high-schooler, and if they say that you’re too young for this or that, chances are they are correct. I know that if you are a teenager or in your early 20’s it is the very thing that is the hardest to do, but I do urge you, try to listen. You've been there you understand"
This stanza speaks so true. Sometimes I look back and think of those times and emotions I could have shared only with Joey. But then I also reflect, that if I had not gone through those relationships, I wouldn’t have been the girl I was when I met him, maybe we wouldn’t have clicked. We would not have brought the maturity and experiences we’ve earned from relationships past into what we have today. Still, I wish that Joey and I could have saved some broken hearts on our way to each other, ours included. Others who broke my heart, they were like northern stars"
I remember when Joey sang this song to me on our first videoke date (he would insist that he never did). I thought that it was so apt for us. 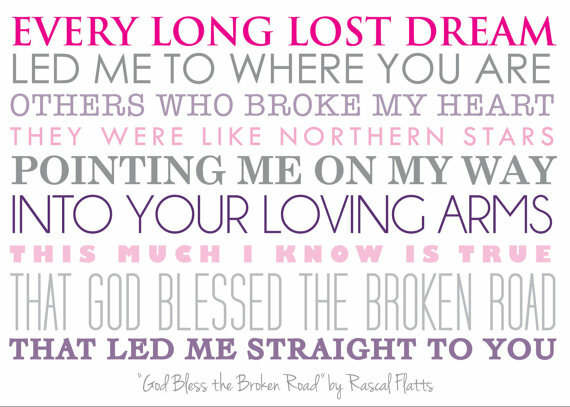 That God truly blessed the road that led us straight to each other. With our mended hearts and mature selves, we were both ready for the next step, and the timing, His timing, was perfect. I was nearly 29 when I met Joey, we got married two years after. I write this as an encouragement to those who might be thinking they’re destined to be single forever - when God moves and appoints a husband for you, He will make it clearly known, and your age or the length of time you and your partner have known each other will not matter. And you will have peace in your heart that wasn’t there in times before. It is true, you’ll just know. In the meantime, wait patiently for His plans for you to unfold while doing your best to grow in character and spirit. Thank you for reading! God bless the road you are walking on and I do hope it's not broken.